Millions of teenagers and young adults are at risk of developing hearing loss due to the unsafe use of personal audio devices such as smartphones and MP3 players and exposure to damaging levels of sound at noisy entertainment venues including nightclubs, discotheques, bars, pubs and sporting events. The emerging pattern of listening regularly at high volume and for a long duration poses a serious threat to one’s hearing. Hearing is a precious faculty, which impacts educational, professional and social development. The permissible time for safe listening decreases as sound levels increase. 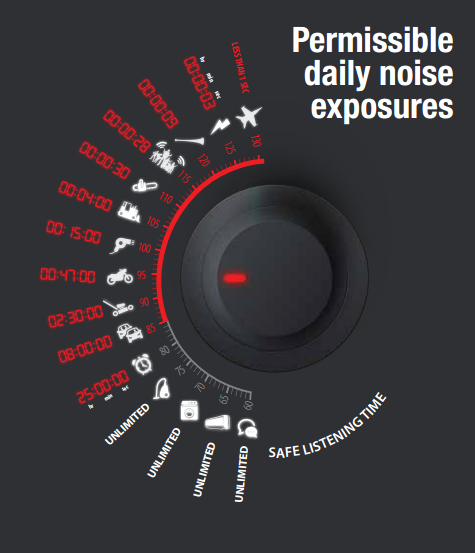 This graphic explains the permissible daily noise exposures at different decibel (dB) levels. It shows examples of various levels of sound produced by different objects, highlighting the maximum safe listening duration in hours, minutes and seconds for each dB level. The daily recommended safe volume level of any sound is below 85 dB for a maximum duration of eight hours. Respect safe listening levels. Determine the safe listening level on a personal audio device by setting the volume to a comfortable level in a quiet environment to no more than 60% of maximum volume. Wear earplugs. When frequenting nightclubs, discotheques, bars, pubs, sporting events and other noisy places, use earplugs as hearing protection. Well-inserted earplugs can help to reduce the level of exposure to noise considerably. Use carefully fitted, and if possible, noisecancelling earphones/headphones. If suited to the individual user, earphones and headphones allow music to be heard clearly at lower levels of volume. Noise-cancelling earphones and headphones cut down background noise, so that you can hear sounds at lower volumes than otherwise needed. Have short listening breaks. When going to nightclubs, discotheques, bars, pubs, sporting events and other noisy places, take short listening breaks to help reduce the overall duration of noise exposure. Move away from loud sounds. At a noisy venue, stay as far away as possible from sound sources such as loudspeakers. Moving to quieter locations within venues can reduce the level of exposure. Limit the daily use of personal audio devices. While it is important to keep the volume down, limiting the use of personal audio devices to less than one hour a day would do much to reduce noise exposure. Use smartphone technology to measure noise exposure levels and inform yourself about the risk for noise-induced hearing loss from your personal audio device. Applications or “apps” accessible through the smartphones can help by displaying noise intensity levels in decibels and indicating whether exposure to a particular level of sound is risky. Know your product, its safety features and its safe listening level. Seek help from a hearing health care professional in case of tinnitus or difficulty in hearing high-pitched sounds such as doorbells, telephones or alarm clocks; understanding speech, especially over the telephone; or following conversations in noisy environments, such as in restaurants or venues for other social gatherings. Take advantage of the services offered by local businesses like THH, schools, workplaces and communities for periodic hearing check-ups, as such screening can help to identify the onset of hearing loss at an early stage. Make Listening Safe. Once you lose your hearing, it won’t come back!